Some Douglas County students and parents decided to make the most of Martin Luther King Jr. Day by exploring options for post-secondary education and careers. About 20 people attended a free College and Career Planning Workshop hosted by the AmeriCorps members of Douglas County Partners for Student Success (DCPSS) and Phoenix School of Roseburg and held at the Boys & Girls Club of the Umpqua Valley in Roseburg. 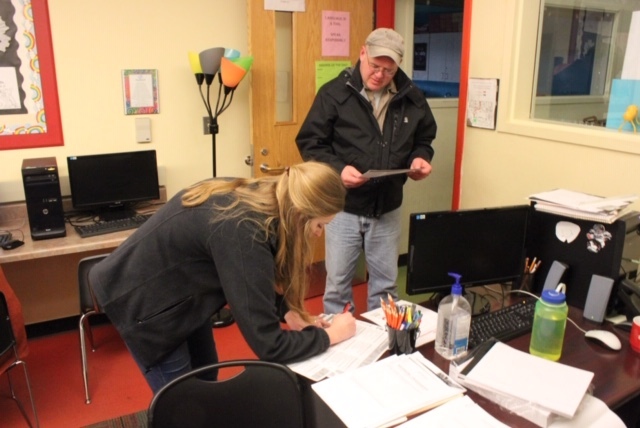 Ten volunteers assisted participants with tasks such as filling out the Free Application for Federal Student Aid (FAFSA) and the Office of Student Access and Completion scholarship application, as well as guiding students through college and career exploration. The AmeriCorps members organized and hosted the event as part of their service commitments and to serve as a celebration of community engagement. The event also featured Jessica Richardson and Destiny Hunt from Umpqua Community College, who gave a presentation on the financial aid process and other scholarship events and opportunities. National Guard Recruiter John Bay II discussed opportunities within the National Guard and how the Guard can pay for college, as well. The event complements work occurring in the community through Bright Futures Umpqua, an initiative of Douglas County Partners for Student Success that seeks to enhance career-connected learning opportunities for local youth. AmeriCorps member Summer McDaniel helps at the College and Career Planning Workshop. That means ensuring students understand different post-secondary educational options, from community college, universities and trade schools. Bright Futures Umpqua is also working to help students consider career paths, whether the jobs they may seek require additional school and training or can be fruitful after participating in career and technical education programs in high school.